Goodreads says, "In 1992, a car accident kills a young man and forever changes the lives of three people… Now, twenty years later, they’ll all come to regret the choices they made that day, as the secrets and lies they’ve told to protect each other become the very things that tear their lives apart. After a night of fun, Abby was responsible for the car crash that killed her beloved brother. It is a sin she can never forgive herself for, so she pushes away the man she loves most, knowing that he would eventually hate her for what she’s done, the same way she hates herself. Twenty years later, Abby’s husband, Nate, is also living with a deep sense of guilt. He was the driver who first came upon the scene of Abby’s accident, the man who pulled her to safety before the car erupted in flames, the man who could not save her brother in time. It’s this guilt, this regret that binds them together. They understand each other. Or so Nate believes. In a strange twist of fate, Liam (her old lover—possibly her true soulmate) moves in with his own family next door, releasing a flood of memories that Abby has been trying to keep buried all these years. Abby and Liam, in a complicit agreement, pretend never to have met, yet cannot resist the pull of the past—nor the repercussions of the dark secrets they’ve both been carrying… "
Nate and Abby Morris live a seemingly average life in England. That is until Abby's ex-boyfriend, Liam, moves in next door with his family. But you see, Nate doesn't know that Abby knows their new neighbor intimately. Abby and Liam's history isn't just the average dating tale either. Abby and Liam were majorly in love until an accident kills her brother. Abby blames herself for his death and decides that she doesn't deserve happiness and her former perfect life with Liam. So, she pushes him away and they break up. Except her feelings for Liam never truly stop even though she has married Nate and moved on with her life. Unexpectedly, Liam moves in next door with his son and his wife, Nancy, and he is just as surprised to find Abby as his neighbor. Things get really, really complicated, especially when Liam's son, Zac, shows an interest in Abby's daughter. Can we say awkward? Many secrets are revealed not only about the accident, but also about Liam and Abby's former relationship. Some of the secrets readers may see coming from a mile away, but others will definitely surprise readers. 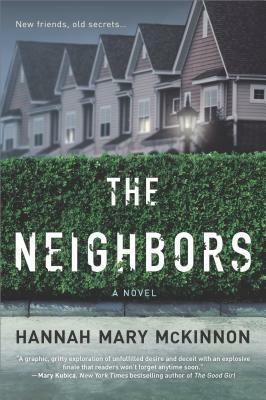 If you like domestic suspense, The Neighbors by Hannah Mary McKinnon will keep you entertained. So, I really didn't like any of the characters in The Neighbors. I wanted to like Abby and did just a little bit towards the beginning of the story, but as things progress, I couldn't get past some of her selfish actions. I did feel bad with how she beats herself up regarding the death of her beloved brother, but, ultimately, she was a tough character to enjoy. That doesn't mean I didn't get sucked into her story, because I definitely did. It was like a train wreck. I couldn't stop reading even though just about every chapter made me cringe. Their new neighbors, Liam and Nancy, were just as despicable in The Neighbors. I knew Liam was holding some major secrets surrounding his past with Abby and I wanted to feel badly for him, but I just couldn't. He chose to marry Nancy and he has a son with her, so he needs to act like an adult. But of course, that didn't happen...not really by any of the adults in the novel. Nancy is the worst. That's all I am going to say about that. I had a few issues with the plot and some of the story lines surrounding cheating, but other than that I thought it was a quick and fun read. It definitely kept me entertained despite the fact that I didn't agree with the characters one bit. The ending of The Neighbors was a tad rushed, but overall, I thought it was soapy fun just like a guilty pleasure or watching your favorite show on Lifetime. The characters were extremely unlikeable, but I found the story entertaining nonetheless. I look forward to your thoughts on it! Thanks for visiting, Jenea. It's always hard for me to read about characters who marry someone else when they still carry a torch for a former partner - and then get into all sorts of problems when they meet up again. It just seems so unfair to everyone. Sounds like a bit of a soap opera! It was extremely unfair and the characters were very selfish, but it made for an entertaining story! It was very reminiscent of a soap opera! Thanks for visiting, Angela!